Chevron Partners Deaf School Sports for the 9th Consecutive Year | Welcome to Chevron Lubricant Lanka PLC. Chevron comes forward for the 9th consecutive year as the sports partner to the deaf schools in the country. Having worked very closely with the differently-abled students since 2002, Chevron together with the Deaf Schools’ Past Pupils’ Association has been effective in promoting the right attitude and mindset amongst all the players; instilling the confidence required to believe in ones self and achieving success. The Deaf Schools’ Six-a-side Softball Cricket and Netball tournaments will take place on Saturday, the 5th of June at the Shalika Grounds, Narahenpita. The Deaf Schools’ Volleyball Tournaments (Boys’ and Girls’) will be played on the 19th at the grounds located in the School for the Deaf in Ratmalana. The tournaments will commence at 8.30 a.m. on both days. To support the deaf schools’ sports activities is underpinned by Chevron’s commitment towards creating opportunities that will help boost the level of confidence and perseverance in the students; instilling the right attitude which will help them challenge themselves for greater performance in the sport, and in their lives. 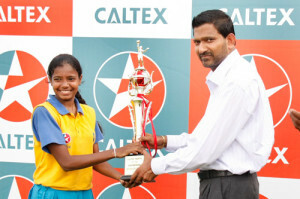 The defending champions, the School for the Deaf in Ratmanala, are the favourites to win the ‘Caltex Trophies’ in cricket and netball. Last year’s champions, Rohana Special School, Matara, hope to win volleyball (Boys’) title yet again, while champions Sivarajah Deaf and Blind School, Mahawewa may go to win the volleyball (Girls’) title. The other participants are Islamic Center for the Physically Handicapped, Thihariya; Yasodara Deaf and Blind School, Balangdoa; Sri Sudarshi Deaf and Blind School, Bandarawela; Sayan Deaf School, Matale; The School for the Deaf and Blind, Tangalle; Sandagala Special School, Kurunegala, and Senkadagala School for the Deaf in Kandy.